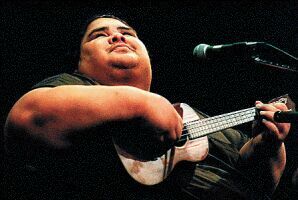 This site is all about the famous Hawaiian singer Israel Kamakawiwo'ole, You can find here various materials such as song lyrics, videos, Guitar tabs and much more. His version for "somewhere over the rainbow" has become extremely popular after his tragic death, and made him a legend. If you like the site, please also sign our guestbook. Copyright © 2009-2019 Kamakawiwo.net All rights reserved. This is just a fan site and not an official site of any kind.